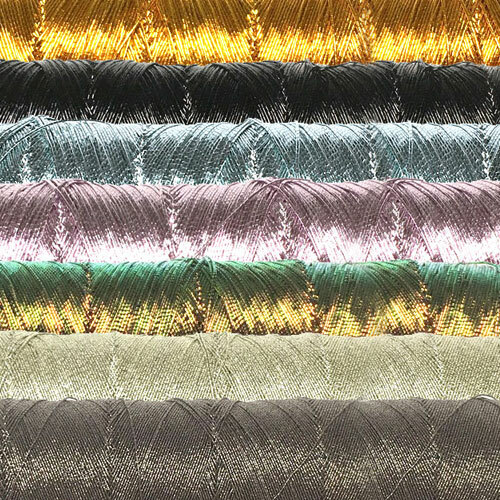 These metallic cords are incredibly soft and pliable and well suited for kumihimo and braiding. Their high sheen and metallic luster is surprising considering their softness and pliability. They are great for blending into braids to add metallic accents. These metallic cords are made in Japan with a gimp construction, which means that a cord or thread is wrapped around a center core. In this instance the metallic nylon film is wrapped around a cord center. The result is soft and pliable cords. The Shiny Metallics looks like metallic wire. The Iridescent Metallics are amazing iridescent colors. The Fine Metallics have a subtle texture and sheen. These cords have centers that are either black or white. Handle these cords with care. Do no twist them clockwise, it will unwrap the outer ribbon that is wound around the center core. The cord can handle some counter clockwise twisting. Not suited for knotting, micro macrame and square knotting as the knots damage the gimp cord construction. Wash gently by hand, let dry flat. Spools are approximately 4.5 inch (11.2 cm) wide. Tips for Kumihimo - Use as a blending element for metallic accents, singly or in multiples. If used singly, blend in a length of C-Lon Micro Cord to the Fine Metallics to add strength. Make a short sample and test it prior to proceeding with a full piece. Dark colors may bleed slightly so do not mix them with white cord or white yarn or test the braid prior to proceeding. Personal Note - I have been looking for metallic cords, but until now I have stayed away. Metallics are usually too scratchy or they have no tensile strength - these are neither. So far, I have only tested these new metallics for kumihimo. Check my new tutorial HERE. I plan to test them for other techniques, such as wrapping. Let me know if you want free samples to test as long as you are willing to share the results. Very soft, yet strong, with a solid gloss and a softness that can’t be imagined from its wire-like look. Great as an addition to braids or a blending element. Cord diameter is somewhere between C-Lon Micro and Fine Weight Cord. Colors changes depending on orientation. Similar to the shiny metallic cord listed above, but a bit thinner. Great as a blending element. Cord diameter is a bit larger than C-Lon Micro Cord. Fine texture, soft, with a bit of grit. Beautiful sheen. This cord is thinner than the ones listed above, with lower tensile strength. Great as a blending element for kumihimo braids or braided in strands. Cord diameter is about the size of C-Lon Micro Cord. About colors - While every attempt was made to reproduce colors accurately, colors on your monitor may not precisely match actual thread colors. Dye lots from manufacturer may vary!